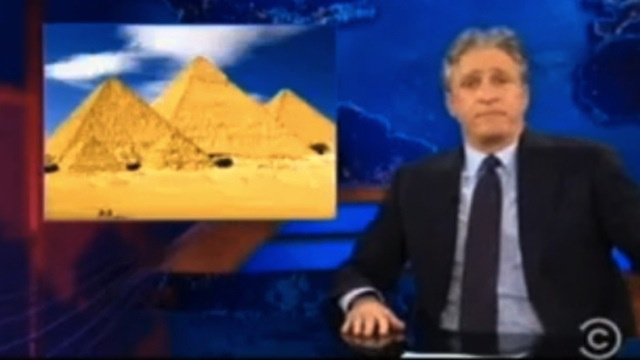 Jon Stewart took his politically engaged American satire to Cairo on Friday, appearing on a show hosted by the man known as “Egypt’s Jon Stewart”, who has faced investigation for insulting the president and Islam. Youssef is a cardiologist whose online comedy clips inspired by Stewart’s “Daily Show” won him wild popularity and a prime-time TV show after the 2011 revolution that ended military rule. He paid tribute to his guest as a personal inspiration as the pair traded gags over Stewart’s impressions of a visit to Cairo. With Egypt still in ferment and elected Islamist President Mohamed Mursi facing off against liberals who fear he plans to smother personal freedoms, Youssef was released on bail after being questioned in March over alleged insults to Mursi and the channel he appears on was threatened with losing its licence. Criticising such moves, which have also drawn reproaches for Egypt from the U.S. government, Stewart said: “A joke has never shot teargas at a group of people in a park. It’s just talk. Now. Stewart, go to Tel Aviv, and have a good show there! YAYYYYY Emilie but I predict pigs will fly to the moon first…..